Introducing the next in my series of photography cliches: Smoke. Click on the picture to see a few other examples. The cool thing about surrealist photography projects is that, when you make a technical flaw, you can simply photoshop the heck out of it and pretend the photoshopping was part of the "artistic process." 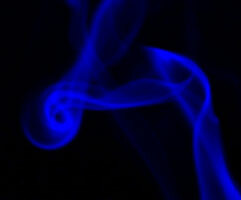 Remember, I'm not trying to take pictures of smoke, I'm trying to make pictures using smoke. That's my line, and I'm sticking to it.